The November 6, 2011 Special Event, a Master Class led by AMSF Founder, Matt Harre, featured beginning and intermediate students. It was held in the home of Joyce Morton on a gorgeous fall afternoon in a lovely venue for a Special Event, and refreshments following the program were plentiful and delicious. Dorothea Shellow, AMSF Special Event Coordinator, began the afternoon by thanking Joyce for hosting, and by introducing long-time AMSF members and board members present in the audience. There were many newer members in the audience who may not yet have been introduced to some of the "old-timers." Matt Harre then gave an opening address. Be sure to read it! Along the way, he spoke of "the laziness of self-denigration," urging all of us to avoid it (though it is a nice phrase). 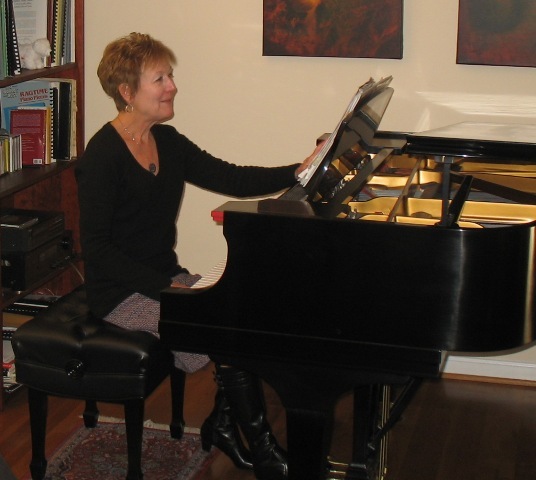 Jan Harper played the Adagio Sostenuto movement of Beethoven's Sonata Op. 27, No. 2, (Moonlight). Jan began to play, but was stopped after just a few measures as Matt pointed out that she had her foot on the middle pedal instead of the damper pedal, plus he helped her adjust the bench to a more appropriate height. Jan began the piece again, and this time finished to applause. Matt's first comments concerned counting the beats while playing. Actually, all 5 performers were asked some version of, "Do you count as you play?" He suggested she try playing a few measures to the count of 2/2, rather than the 4/4 that is incorrectly indicated in some editions. Addressing the melody, which is marked "pp", Matt stated that melodies simply cannot be played "pp", even though that is what the dynamic says. The given dynamc is an average and melodies always need to be "mf", or louder. The performer should listen to how their music sounds, rather than listening for how accurately their performance is/isn't going. As Jan applied Matt's suggestions, she and the audience could hear the improvements. Jan Harper following her performance at a master class led by Matthew Harre. Gina Gianfala played from Eleven Dreams of a Dragonfly, by Francesco Stratta--a 20th Century contemporary piece she purchased in Italy, consisting of a short theme and eleven short variations. Gina played the theme and nine of the variations. After applause, Matt complimented Gina on her terrific bows, unusual for adults or children, with which she began and ended her performance. He then asked Gina, "Do you count as you play?" Gina was, but she was counting sixteenth notes when there actually weren't any written, so she was able to increase her speed when she only counted the eighth notes. In the 4th variation, The Last Dance, Matt helped Gina incorporate more of a dance (3/4) rhythm into her playing, and he helped her with some pedaling adjustments in the 9th variation, The Sad Fisherman. Gina did a great job of accomplishing the changes, and again, the improvements were clearly heard by the audience. Barbara Freggens played next. She played a Chopin Prelude, Op. 28, No. 15--again, to applause. Matt first spoke of voicing, suggesting that one listen to that voice you want the audience to hear first and foremost. He encouraged singing the melody in one's head, listening and finding places where one needs and wants to breathe, giving the melody an almost operatic quality--and, again, stressed that melodies cannot be played "pp", no matter if they are so marked. Matt also demonstrated relaxing the hand between repeated stretches to avoid fatigue caused by keeping the hand extended through an entire passage. Barbara's final playing of a passage won another round of applause. Linda Harris then played Viennese Refrain arranged by Hugo Frey, a very delightful waltz. Matt again raised the subject of counting while playing, also suggesting that Linda incorporate more physical motion into her performance. Linda replayed a passage, accomplishing both suggestions quite successfully. Matt also recommended slowing the piece as she practiced it to gain certainty of the notes and rhythmic continuity, and to practice each hand separately. Given that Linda is a new member who thought she couldn't replay the piece that she'd prepared for last week's Prelude Recital, she did a terrific job on the new piece that she worked on for the Master Class. 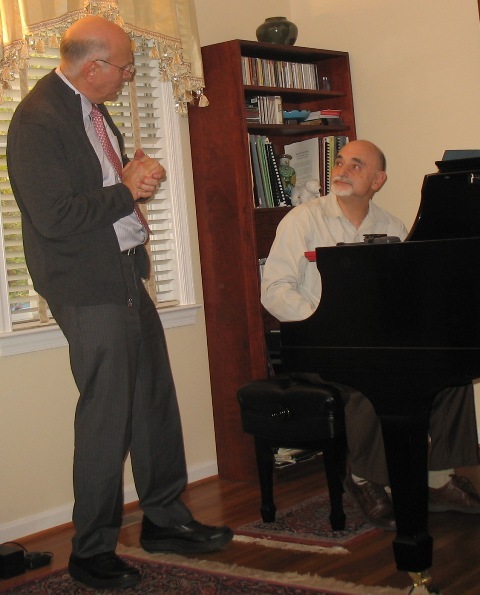 Ilya Rabinovitch listens intently to instruction offered by Matthew Harre during a master class. Ilya Rabinovich played Fast Zu Ernst, (Almost Too Serious), from Robert Schumann's Kinderzenen, which the audience enjoyed. And, again, counting sixteenth note beats in a measure, as one plays, came to the fore. The melody is in eighth notes and begins on an off beat as do all the successive melody notes. It is the quarter note beat that needs to be established at the beginning of the piece or the rest of it won't feel right either. Once Ilya worked that out, Matt addressed hearing the base line, even though it wasn't the melody of the piece. Ilya played from memory, with some lapses, so Matt discussed the utility of practicing memory work with one's eyes shut to give a sense of space and what comes next, counting as one plays, of course. Ilya did a great job! As you've likely concluded, Matt Harre's suggestions and recommendations apply to ALL AMSF members and performers. Count as you play. Listen to the melody. Melodies have dynamics which include crescendos and decrescendo, but that does not include "pp." Also listen to the accompanying voices as you play. And, in response to questions from the audience, Matt strongly asserted that older persons CAN play by memory; that if a piece is not getting better with practice, then you're likely not practicing it correctly; and, you need to listen to what you play. Listen for what you want an audience to hear, and when you notice an improvement, pay attention to what you did to bring about that result. This was a Master Class that gave inspiration to all present as we practice and struggle along the route to some degree of piano mastery.